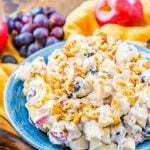 This Apple Grape Salad is a vintage dessert salad made with cream cheese, yogurt, apples, grapes, walnuts, and sugar! It's a potluck favorite and everyone will want the recipe! Walnuts can be substituted for pecans.